Last Friday, I ran my seventh race of the year, and my second repeat race. Just like last year, Preston and I ran the Firecracker 5k with Team RWB on the 4th of July as a way to help raise funds for the USO. Having run this race last year, I was well aware of the course and knew that I needed to pace myself for a gradual uphill during the last portion of the course. Just like with other Potomac River Running races, bib pickup was super easy – I think I was in and out of the PR Store in Reston in less than two minutes when I picked up our bibs last Wednesday. There are so many benefits to PR Races, including free race photos, plenty of post race food and water, and very reasonable registration prices. 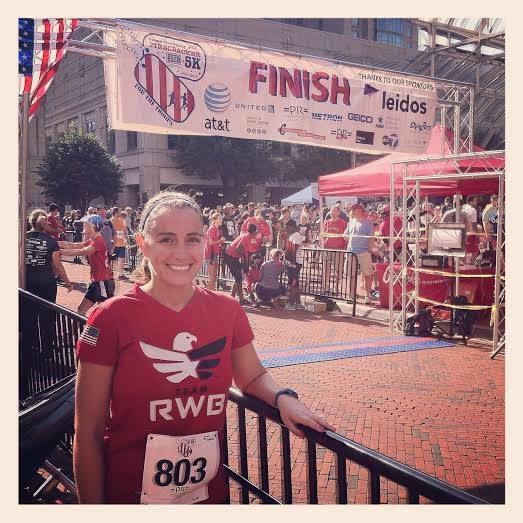 If you live in the DC area and haven’t checked out their races yet, you definitely should! 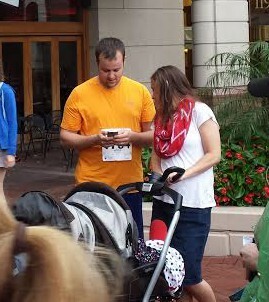 On Friday we arrived at Reston Town Center, where the race was held, about 45 minutes before the start of the race. While driving there, it was raining on and off, and I started to think that we’d be running this race in the rain. However, once we parked the car it stopped raining, and the humidity was temporarily under control. 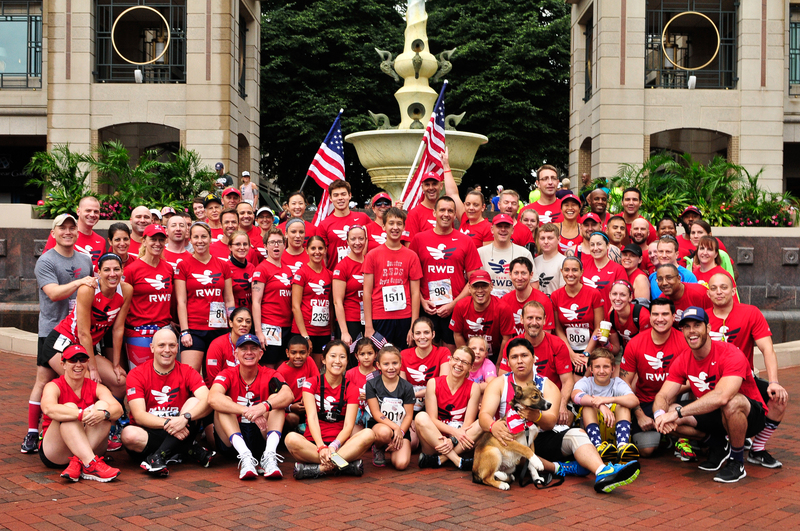 We met up with fellow Team RWB members for a pre race photo and a pep talk from the DC area chapter captain, and then we headed to the start line. Because there were only about 2,500 runners and walkers, there weren’t any corrals for this race. However, there were suggested start areas based on predicted paces, so Preston and I lined up in the 9:00-10:00 minute/mile pace area. Although his pace is much faster than mine, he wanted to start the race with me. While we waited for the race to start, I noticed a TLC camera, and began to wonder why TLC was at a small local race. During the race itself I noticed TLC’s presence another two or three times, which had me intrigued as to what was going on. I had my suspicion, and after the race I got my answer. As the race started, I noticed that my legs felt very heavy. I had done a lower body weight training workout two days prior, and my legs were definitely feeling it. It took about a mile before I felt like I had finally gotten into a good groove. By this time though, the humidity had definitely kicked into high gear, and it became increasingly difficult to breathe while running. I made it to the water station without having to stop for a walk break, and after the water station ran again without walking until around the 2.25 mile point of the course. During the last mile of the race I took two additional walk breaks – for one minute each – and during my second walk break I knew that it would be difficult to meet my A and B goals. I finished the race in 32:35 (10:29 min/mile pace), which is 2.5 minutes faster than last year’s Firecracker 5k finish time! Although I ran this race almost a minute slower than my current 5k PR, I’m more than happy with the improvement from last year’s finish time. I also met my C goal, which was to run the race faster than I did last year. QOTD: Have you ever run a local race and spotted a celebrity at it? This entry was posted in Races and tagged 19 Kids and Counting, 5K, Firecracker 5K, running. Bookmark the permalink. Great recap! And yes! I’ve saw a few Ravens players and actors (from House of Cards) at the Brigance Brigade 5.7k earlier this year- it was super cool! Great time improvement! I think it’s hard to see results in the summer because the weather in the Mid-Atlantic can affect your pace a considerable amount. Bravo to you for beating last year’s time! I hear ya about the summer weather in this area. Its so unpredictable, and its difficult to know if/when you’ll be able to push yourself since its constantly changing. Yes, hopefully we’ll be able to meet at one. Our schedule usually makes it difficult for us to make any of the weekly runs, but we’re often at the bigger events, especially those that involve races. Congrats on a great race Kathryn! I’ve always heard of celebrities being at a race but I’ve never seen them there myself. Maybe one day! Yay for enlarging my blogger circle! Great race recap and congrats! 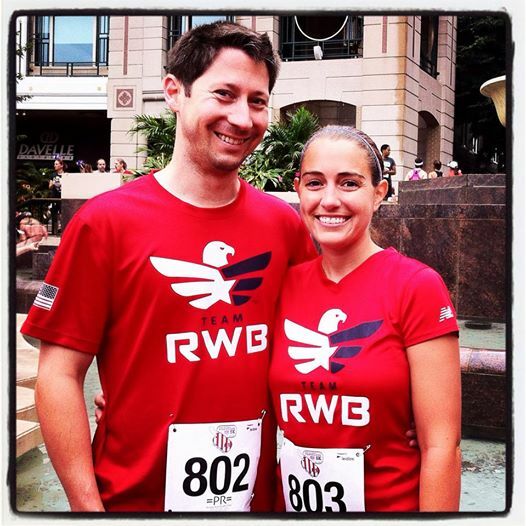 Love what Team RWB stands for. Thanks, and I completely agree. Haha, I don’t watch that show but if you find out when it will air let me know. I’d like to watch. Even though you didn’t PR you still did great! You know what?? I think I met your husband. I thought he looked like Mark Erwin and went up and asked if he was Mark, LOL….looking at your hubby’s pic, I think it was him!! Funny you say that, because I was off getting more food and when I got back to where Preston was he said that somebody walked up and asked him if he was Mark. I shouldn’t have walked away to get a bagel! Agh! Next time, we’ll definitely have to connect in person. Congrats on the course PR Kathryn! I can’t wait for the running episode – it will be SO funny if we see people we “know” or really know haha. I hope they did not capture me taking photos of them – thanks for the photo cred and mention 🙂 See you in Leesburg! Seeing people you know on TV is always entertaining. One of my old coworkers and his wife were on the Newlywed Game a couple of years ago and it was so weird to watch them on TV! See you next month in Leesburg!